Geert Wilders is the uber-right, anti-Muslim Dutch politician who is banned from entering the UK.And now: he and his party are surging. 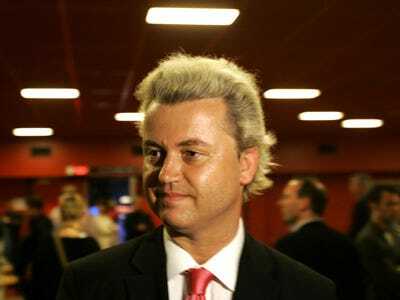 A new poll shows Wilders capturing huge swaths of the population, and his party set to win the most seats in June 9 elections. European flirtation with the nationalist right comes and goes obviously. France shocked the world early last decade when Jean Marie Le Pen made it into the runoff against Jaque Chirac. Another anti-immigrant Dutch politician, Pim Fortuyn, looked set to capture his country’s election before being murdered. In Austria, Nazy sympathist Jörg Haider had bouts of electoral success. But the huge surge in the right never really amounts to much, or a huge trend. Odds are it won’t this time, but with the Europe facing a true existential crisis at the moment, along with a Tea Party-like undercurrent of populist anger, the possibility of a real lurch rightward can’t completely be counted out.